Born on 30th March 1899 in Richmond, Surrey, England, Arthur Hawkins was to start his seafaring life at the tender age of ten. In 1909, the son of a by now single mother of limited means, he was placed aboard the training ship Exmouth at Grays on the River Thames. On the 1st April 1915, during WW1 and immediately following his fifteenth birthday, he signed on as a deck boy on his first ship. The ship was the ex-Belgian Red Star Line vessel Northland, then being operated by White Star Line. On 15th February 1917, by now an Ordinary Seaman, he was onboard the White Star Line Celtic when she was badly damaged after hitting a mine shortly after leaving Liverpool, England. 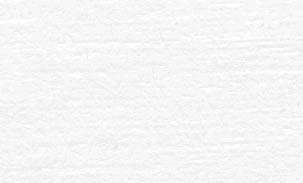 She had to return to Liverpool and the simple entry in his Discharge Book is ~ Voyage Abandoned. After the war he continued to progress with his seagoing career, going from Ordinary Seaman to Able Seaman and eventually Quartermaster. Apparently serving exclusively with White Star Line sailing mostly from Liverpool on passenger liners. He apparently took his Third Mates Certificate during 1922/23 and sailed in that capacity on 2nd March 1923 on the Skipton Castle. Just five years later on 13th February 1928 he qualified at Liverpool, as a ‘Master of Foreign-Going Steamships’, this only thirteen years after starting as a Deck Boy. Quite an achievement! After qualifying as a Master, he sailed as First Mate for the next four years. The 23rd April 1934 is the date of the last entry in his discharge book, paying off the ship Arcwear in his capacity as First Mate. Soon after that date, he again sailed on the Arcwear but for the first time as Master. Amongst his voyages as Master for a number of owners, was a voyage for a Greek owner from Antwerp to Odessa and Sevastopol in 1937, to load munitions for China during the Sino-Japanese war. 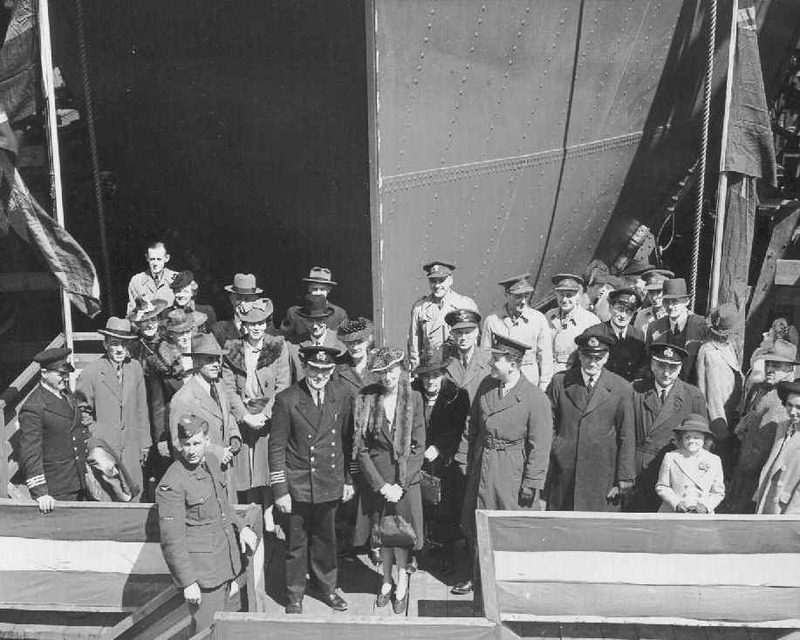 Sometime after the outbreak of the Second World War in 1939, he, like so many seafarers, found himself serving with the Ministry of War Transport (MOWT). 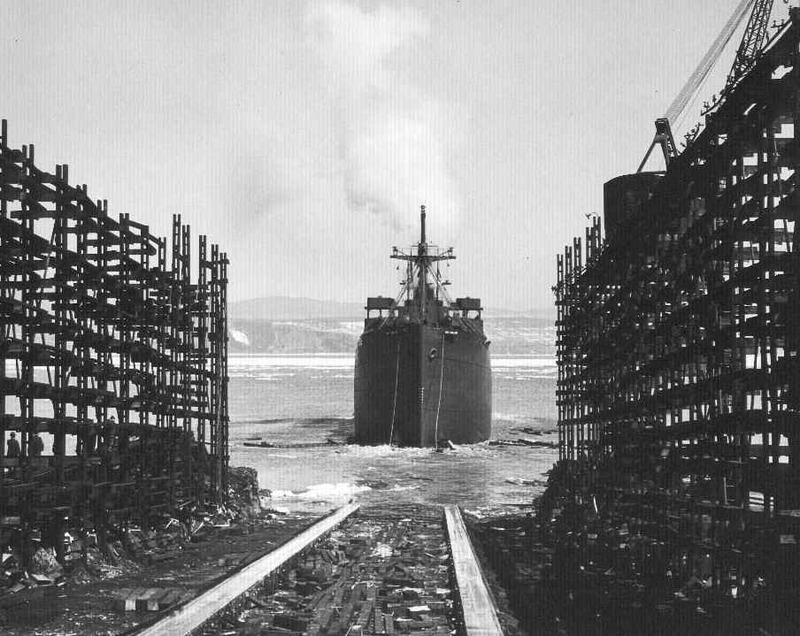 One of those commands for the MOTW was the Empire Sunrise, which was built at J. L. Thompson’s yard in Sunderland, England, in 1941. It was whilst sailing with the Empire Sunrise with a cargo of steel and timber, in the eastbound convoy SC107, that he was torpedoed. The ship was first hit in the early hours of 2nd November 1942, by U402 and, as she had stayed afloat, a few hours later by U84, after which she sank. All the crew were saved by the Rescue Ship Stockport being landed eventually in Iceland, where the crew spent Christmas before being returned to the UK. Sometime in early 1943 Captain Hawkins made his way back across to Atlantic, to Canada, to take command of a new-building ship the Fort Carillon, which was then under construction at Louzon, Canada on the St. Lawrence River near Quebec. 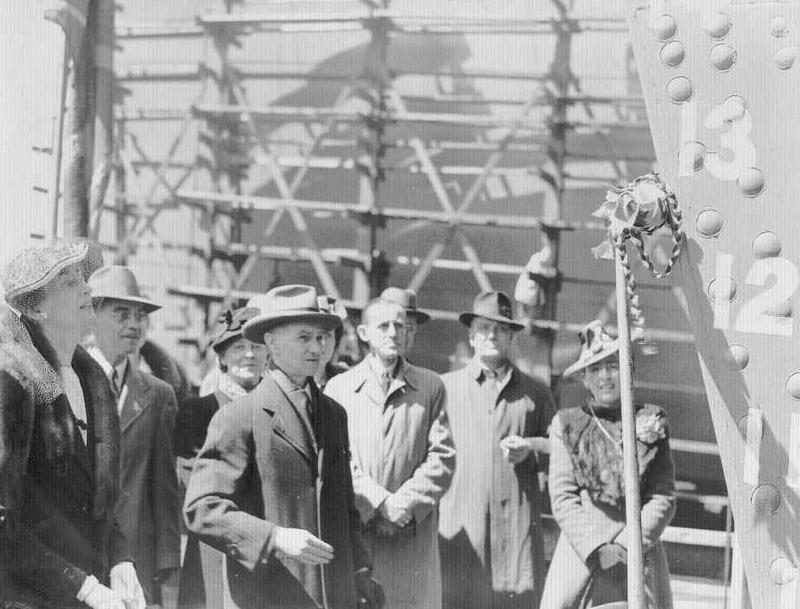 He was present at its launch (centre of the first photograph above) and it was officially delivered in May 1943. Captain Hawkins was somewhat unimpressed with the fact that the Fort Carillon was launched with steam up, as this apparently caused damage to the boiler tubes, which necessitated a dry-docking at Quebec to have them repaired. 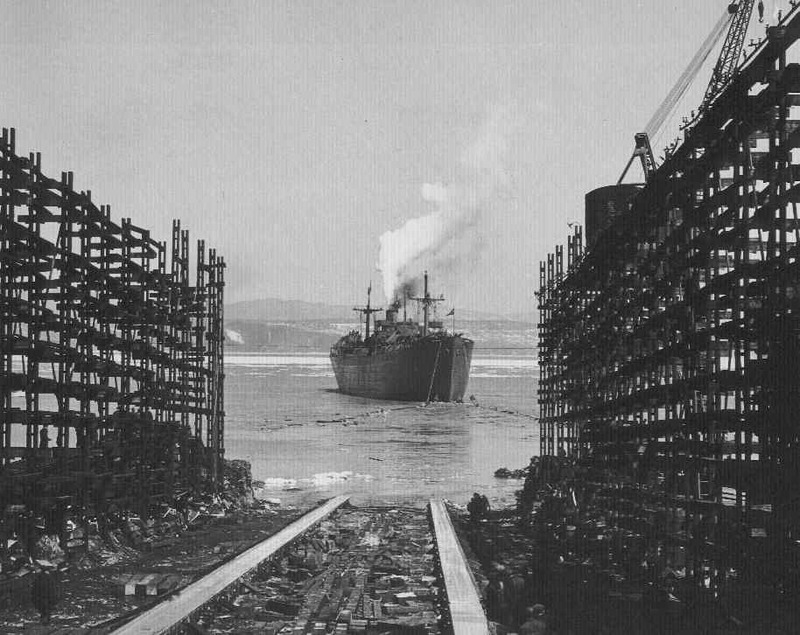 After leaving dry-dock at Quebec they proceeded to Montreal to load. 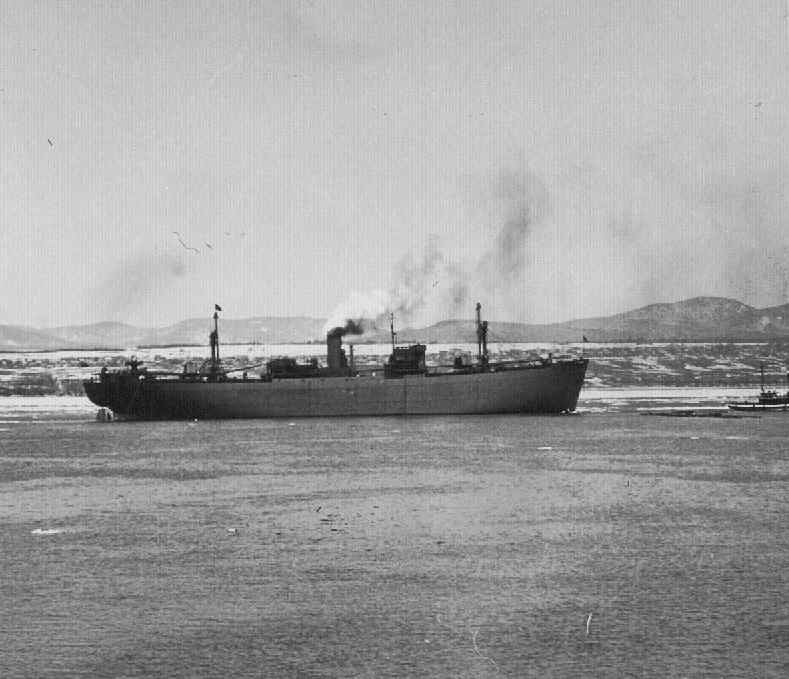 They then made passage (presumably in convoy) via Rio de Janeiro, Brazil, and then Cape Town, South Africa, on each occasion for bunkers, to Port Said, having first transited the Suez Canal. After spending a month in Port Said they sailed to Haifa, Palestine, to load potash for Norfolk, Virginia, U.S.A. proceeding back through the Suez Canal and bunkering en-route at Durban, South Africa. 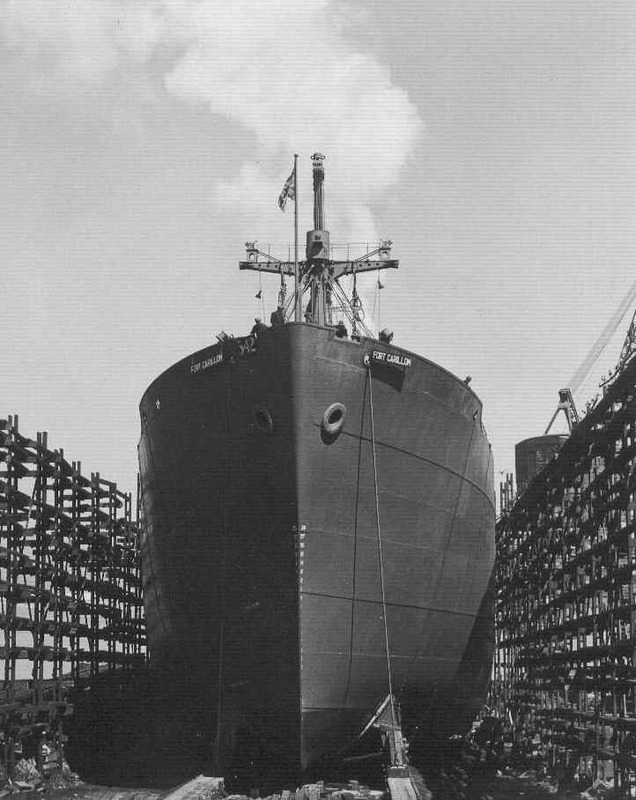 In due course, sometime in 1944, Captain Hawkins took command of the newly built ship Empire Earl, by the William Doxford & Sons Shipyard, at Sunderland, England. He then made at least twenty-one voyages onboard the Empire Earl, mainly from the River Thames to the now famous temporary Mulberry harbour established at Arromanches, France, after the D-day landings of June 6th 1944. Some of those later voyages were to Antwerp the port having been just reopened to allied shipping. For his service during the Second World War Captain Hawkins was awarded the following Campaign Stars, Clasps and Medals: The 1939-45 Star, The Atlantic Star, The Clasp to The Atlantic Star (France & Germany), The Africa Star, The Italy Star and The War Medal 1939-45. His work then for the M.O.W.T. ended shortly after the end of the war in Europe in 1945. Captain Hawkins was disgusted to discover, like many other seafarers, that after all the dangers that he had experienced, and after all his efforts for his country, there was no offer of seagoing work anywhere to be had. He decided there and then to try to make a new life for himself and his wife in Canada. He obtained work with a Canadian stevedoring company in Halifax, Nova Scotia and was soon firmly established with his new company and career. Some time later, around the time of the opening of the St. Lawrence Seaway he was asked by the stevedoring company to open up an office for them in Toronto, which he did. After living in Toronto for a few years with his wife, who had joined him from England once he was established in Canada, he was invited to join a New York stevedoring company, an offer that he accepted. He was to become vice-President of the company only leaving that position in 1967/68 to return to England where his wife died a few years later. Captain Arthur Hawkins, a grand old man of the sea, died in 1989 aged ninety, having had a very happy last ten years of life with his second wife Kathleen who had shared his pleasure at being able to go for cruises aboard the Cunard Line ship Queen Elizabeth II and other cruise ships during those final ten years of his life. Not a bad lifetime of achievements for a lad of such humble beginnings.